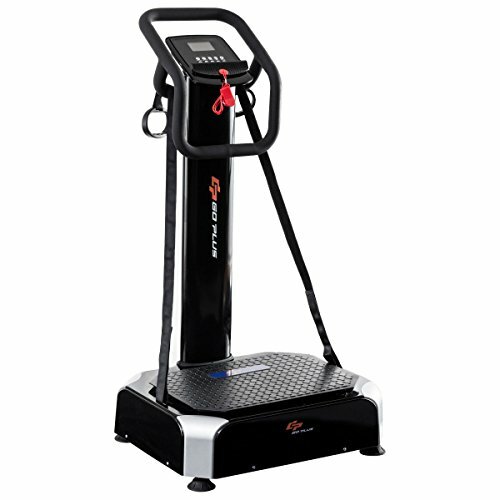 You can shape your body easily with this dual motors 2000W full body vibration plate machine. Just need to exercise For 5-10 minutes every day. Goplus vibration plate machine Aids Flexibility , Co-Ordination And Circulation, Toning All Parts Of The Body Through Vibration Training - A Method Used To Train Astronauts By Developing Their Muscles And Helping Them To Get Used To Unusual Stresses And Strains Their Bodies Will Be Exposed To In Space. Don't Hesitate To Buy One! Dimensions: 26" x 23" x 50"
【Dual Protection】Non-kid footboard and safety key design to guarantee safety, dual protection to avoid falling off from machine. 【2 Bands and MP3 Function are Included】Work with two 40'' oxford material bands to have systemic excise, not only lose weight on back, waist, tummy, thighs and shanks but also arms and shoulders. It also has mp3 audio function. 【16 Speed Manual Mode and 4 Auto Mode】Item has 3 ways of vibration. It can be set to manual mode which has 1 to 16 speed to adjust and 4 auto mode. 【Groove to Place your Phone】This crazy fit vibration platform has a groove beside the screen to place your phone in it. 【Ergonomic Construction】This vibration platform machine is made of durable steel frame with fashionable black coated, ergonomic construction with fashionable streamline design.The material of footboard is rubber, you can stand or sit whatever posture to enjoy massage.